Growing up, my parents always told me that I couldn’t have dessert if I didn’t finish my dinner. The dessert usually consisted of some form of chocolate—so I always made it a habit of finishing my dinner, due to my sweet tooth. Chocolate has a bad rap. It’s sweet, delicious, and typically written off as junk food. But researchers have concluded that eating chocolate on a regular basis can be beneficial for the heart. In a study published in the peer-reviewed journal Heart, researchers discovered that those who consume chocolate on a regular basis have a reduced risk of suffering a stroke or developing cardiovascular disease, compared to those who don’t eat chocolate regularly. The polyphenols, which are bioactive plant compounds found in cocoa beans, can actually protect the heart against several diseases. To contribute to the hypothesis, Howard LeWine from the Harvard Health Blog found a significant difference between those who consumed chocolate and those who avoided it. He discovered that out of those who ate the most chocolate, 12% died of a cardiovascular disease during the study, compared to nearly 18% who didn’t eat chocolate. Study participants provided researchers with more information on their chocolate eating. The study illustrated that the average amount of chocolate consumed was between 16 grams to 100 grams per day. Those who consumed that much chocolate per day had the greatest benefit when it came to preventing cardiovascular disease. Milk chocolate was eaten more frequently by participants than dark chocolate, so it’s possible that the benefits may extend to this type of chocolate, too. The evidence has been so conclusive that some researchers are already organizing a clinical trial where they will be taking the cocoa beans compound and using them in capsule form. Keep in mind that just because the evidence is there, it doesn’t mean that you should start eating chocolate as a meal! Most chocolate bars are high in sugar and fat content, so many health experts recommend limiting yourself to seven ounces of dark chocolate (or four dark chocolate bars) a week—it is also important not to neglect your daily diet as well. 1. Healthy heart: In a Swedish study conducted over a period of nine years, 31,000 women who ate one to two servings of dark chocolate each week cut their risk for heart failure by as much as a third. In a German study, researchers discovered that one square of dark chocolate a day could lower blood pressure and reduce the risk of heart attack and stroke by as much as 39%. Again, the credit goes to chocolate’s flavonoids and antioxidant compounds that increase the flexibility of veins and arteries in the heart. 2. Weight loss: Researchers from the University of Copenhagan discovered that dark chocolate can offer a more filling sensation and reduce the cravings for more sugary and fatty foods. 3. Happier children: Studies have shown that women who consume chocolate during pregnancy are able to handle stress a lot better. In addition, the study concluded that babies were actually happier and smiled more when they were born. 4. Diabetes prevention: I know, you probably wouldn’t think that chocolate could help prevent diabetes, but hear me out. In an Italian study, researchers discovered that people who consumed dark chocolate once a day over a 15-day period saw their insulin resistance drop by nearly 50%—the reason being that flavonoids help increase the nitric oxide production. 5. Reduces stress: In a study conducted by Swiss scientists, researchers observed “stressed” individuals who consumed 1.5 ounces of dark chocolate per day for two weeks. The results? Their stress hormones were significantly reduced. 1. Start by melting the cocoa butter in a double boiler; if you don’t have a boiler, place a glass bowl on top of a small pan (with an inch of water) and melt on medium heat. 2. Once the cocoa butter is melted, remove from the heat and add the cocoa powder and vanilla extract to it. Make sure that the mixture is smooth when you are incorporating the ingredients—you don’t want any liquid to get into the chocolate, as it could make it really soggy. 3. Now that the chocolate is ready to bake, pour it onto a baking sheet. 4. Let it sit for a few hours at room temperature, so it can harden. If you want to speed up the process, put the baking sheet in the fridge. You can leave it in there for up to one week. Remember, chocolate alone will not protect the heart; you need to maintain a healthy diet and exercise on a regular basis. 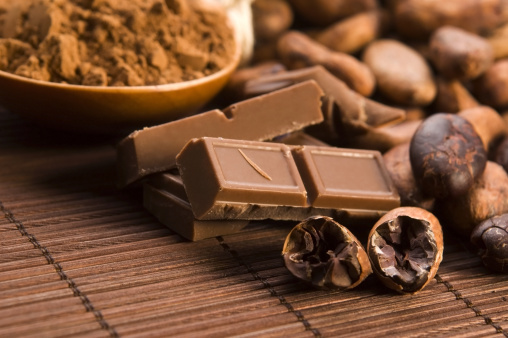 Chocolate will only complement those key elements to maintain a healthy heart. Dennis, Z. “Chocolate is good for the heart, study finds,” PalmBeachPost.com, June 20, 2015; http://www.palmbeachpost.com/news/news/health-med-fit-science/chocolate-good-heart-study-finds/nmgpt/. “9 Health Benefits of Chocolate,” Women’s Health web site; http://www.womenshealthmag.com/health/benefits-of-chocolate?page=0, last accessed June 26, 2015. “Healthy Homemade Chocolate,” Wellness Mama web site; http://wellnessmama.com/6764/chocolate-recipe/, last accessed June 26, 2015.